At some point in life, most of us will face health challenges of some kind. Whether it�s chronic back pain, the stiffness and pain of rheumatoid arthritis, or more serious illnesses, as we age our bodies often stop doing what they used to do with ease. 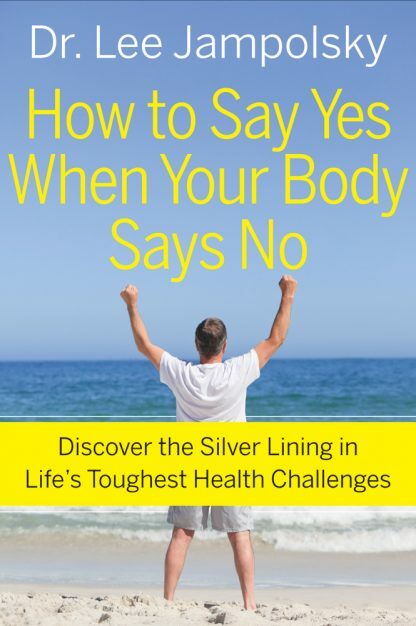 In How To Say Yes When Your Body Says No, psychologist Lee Jampolsky examines how people become overwhelmed, and often unable to cope during a health challenge. He discusses the importance of focusing on inner work in addition to medical treatment, pointing out that the mental diet we feed ourselves has profound effects on our physical well-being. Jampolsky shares his personal health challenges, from spending months in a body cast as a young man to going deaf from an autoimmune disease. He shows how learning to alter one�s thoughts and beliefs about health is the key to physical well being. How to Say Yes When Your Body Says No is filled with meditations and exercises to develop an attitude of openness and healing, no matter what physical and emotional challenges we face.